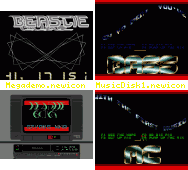 This install applies to "Music Disk 1" © 1991 Bass. The installed demo requires 0.5 MB ChipMem (+0.8 MB for preload). There are some quality tunes here as usual in Bass demos. instruction which was not needed and, even worse, a1 was undefined. CUSTOM1 is not used all there won't be any song loaded. Enjoy the tunes and Have a nice weekend everyone.